Paris Letters (Sourcebooks) is an interesting, delightful little book about freeing yourself from a boring job (albeit a well-paying one) and lackluster social life by escaping to Paris to start over. The book’s author, Janice MacLeod (of the clan MacLeod), was a successful copywriter living in Los Angeles, but was living a life that left her feeling burned out and depressed. Needing a change for the better, the author embarked on a several-year journey to clean out her L.A. life and create a new one in Europe. Despite loving a good “pack-up-your-life-and-travel” story, I find that these types of books can become tiresome due to the author’s need to whine (we all do it, I realize I’m not immune) about what they see as problems with having well-paying jobs in large urban settings. 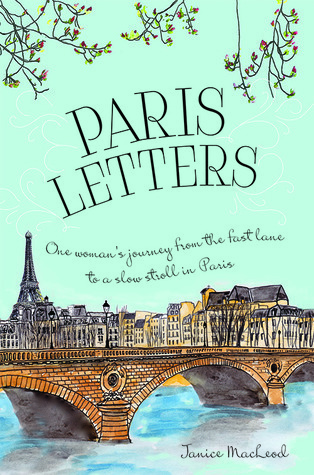 Paris Letters manages to avoid that trap, and the book even surprised me with how funny and poignant it turned out to be. Not as spiritual as Eat, Pray, Love, but not as yuppy as Lunch in Paris. The Paris Letters is a funny and sarcastic account of a woman fed up with her life in the rat race of corporate America who decides to take small steps (and one very big one) towards a happier and more fulfilling future. I do want to mention that I am a huge fan of the “escapism” genre, which includes any book where the author decides to pack up their belongings and find out who they are in a new land. (They can be a bit more complex than that, but to keep it real that’s what I’m going with as a synopsis.) I don’t know if by loving these books my mind is trying to tell me that I am looking for an escape from reality, but honestly, isn’t that what books are about anyway? Plus, my bank account and husband won’t let me escape to Paris, so I’ll just have to settle for living vicariously through these authors. Moving on from what became a tangent on escaping, I want to point out that if you’re not into these types of books, better skip out on this one. If you are like me (don’t be ashamed!) and want a charming little story about a woman finding herself (literally and metaphorically) in Paris, then this book is a must-read. I think we all go through a similar stage in life. My wife and I were about 2 weeks from selling everything and starting over in Hawaii. I still wonder if we made the right decision.